Compared to Windows Mobile, Symbian doesn’t leave much room for tweaking. But since everything work so well from the start, there’s basically no need for it either. Symbian is of course also comparatively straightforward and user-friendly, so is it really necessary with a tutorial like this? Well, if you’re new to the OS or smartphones in general, I hope a few pointers might come in handy. Besides, some mobile users just aren’t interested in optimization and try to avoid settings: this article is mainly intended for them. 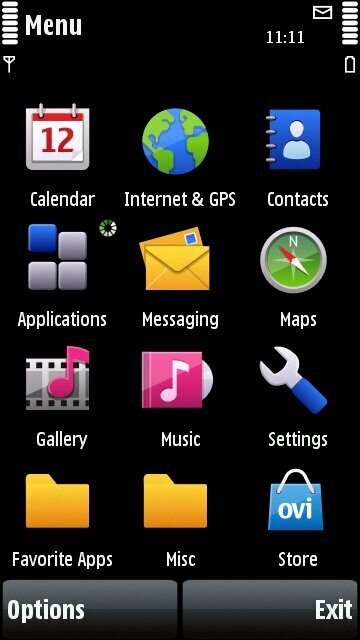 In this post, I will describe the tweaks I apply to a Nokia 5800 that has all the default settings. Your idea of Nokia Tube nirvana may of course differ from mine, but hopefully this will give you a rough idea of what can be done. Everything that is described in this tutorial can be applied to the Nokia N97 as well, and probably most other Symbian 5th Edition (also known as Symbian^1) devices. The first thing I usually do with a new Symbian device, is to organize the main menu to my liking. I keep my most frequently used applications at the top, so I don’t have to scroll down to launch them. I also create new folders and categorize all my software. That way I avoid having to browse through a huge list of programs and can find what I’m looking for quicker. Organizing your main menu is especially useful if you have a lot of software installed on your handset. To do this, simply enter the main menu, tap Options/Organise and start moving things around. Naturally I change the Ringing tone, at the top of the screen. I have a pack of ringtones I created myself, by making MP3-files of the best parts of my favorite songs using Adobe Audition. You may download the entire set of Nokia N97 and Nokia E75 ringtones from the Handheld Blog if you want more signals to choose from. 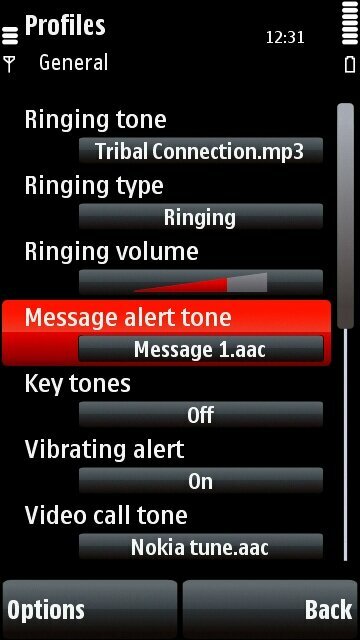 I also adjust the Ringing volume and change the Message alert tone. I turn the Key tones, Warning tones and Touch screen tones off, because I reckon it will save some battery power, if ever so little, and frankly I find those beeps and alerts rather annoying and redundant anyway. A neat feature of Symbian S60 devices, is the Say caller’s name option – if turned on, your device will say the name of who’s calling out loud. Finally, I create a new profile (Options/Create new) called Vibrate, that simply vibrates when there’s a call and nothing else. I also create a profile that is activated whenever a headset is connected, and I optimize it for that purpose. You select which profile to activate when a headset is connected from Settings/Phone/Accessories/Headset/Default profile. Themes and Wallpapers Now, guys and gals, it’s time for some themes and wallpapers! Any chance I get to put my own personal touch on a device, I gladly take. There’s a pretty large wallpaper collection here at TechCredo.com that you might enjoy. The wallpapers all have the WVGA (480×800) resolution, but they look great on the Nokia 5800. I have always been fond of Symbian’s excellent support for themes, and in my opinion, the best place to get themes and wallpapers is the Norwegian Zedge site, which I’ve been visiting from time to time for many years now. They have a vast collection of wallpapers, themes and ringtones for almost every device out there. I get annoyed by TV commercials trying to make you pay for them, that’s absurd. Another good place for 5th Edition themes is MMC Forums, and the S60v5 Themes Blog at DailyMobile.se is also worth checking out. Settings/Personal/Themes/General, and then tapping Options/Theme effects – because a little eye candy never hurt anyone, right? From the above-mentioned Themes screen, you can also set a Call image (the image that is displayed during calls), change the Home screen theme (Basic, Shortcuts bar, Contacts bar) and set the Home screen wallpaper. A neat feature is the Slide show option that will automatically switch between the wallpapers of your choice at a given interval. The full location of this setting is: Main Menu/Settings/Personal/Themes/Wallpaper/Slide show. A feature that I miss on the Nokia 5800, is that a list of the last people you texted is presented when you add a recipient for a message, or at least some kind of “quick contacts” function. The N97 has a Favorite Contacts feature, but alas: there’s no such thing on the Tube. Of course, we have the convenient Home screen Contacts Bar on the Nokia 5800, but it is limited to only four people. However, I’ve found a workaround, and even though it’s far from optimal, it is still better than nothing. Open your contacts and tap the Group icon at the upper right corner, then tap Options/Create new group and enter the name of the “quick contact” you want to create. Tap the new group you’ve just created and then Options/Add member. Select the name of your “quick contact” from the list. Repeat the procedure for each contact shortcut you want to add. I may be the only one who find this useful, though, but I hope I’m not alone. Click the Register button in the middle of the page and follow the prompts if you don’t already have an OVI account. Once you’re signed in, click the Contacts icon in the upper left corner of the screen. In the lower left corner, click the link that says Add a device. Select the Nokia 5800 XpressMusic from the list of phones and click Next. Enter your phone number and your time zone and click the Next button. The setup instructions are now displayed and you should soon receive a text message from OVI. Take note of the PIN code you’ve been assigned, open the text message on your device and enter the PIN code. Tap Options in the lower left corner and then Save. All the settings your phone needs to sync with OVI are now being saved. To start the synchronization, tap the area just left to the battery meter on your home screen and then the connectivity icon on the little screen that pops-up. You are now in the Connectivity settings. Tap Data transfer in the list and then double-tap on the Sync option. Select what you want to synchronize with your account, tap Options in the lower left corner and then select the Synchronise command from the menu. That’s it! You can sync the contacts and calendar entries on your phone with your Google account, via Mail for Exchange. Please note that you should not synchronize with OVI when you use Google Sync, since the two then will collide. If you don’t already have Mail for Exchange, Google MailForExchange_S60_5_0 and install it. Launch Mail for Exchange in the MfE folder, then follow Google’s own step-by-step instructions to finish the synchronization setup. Here’s a list of all the other settings I adjust. I launch the Camera, and tap Options then Settings in the lower-right corner of the screen, to make sure the image quality is at the highest setting and that images are saved to the memory card. You may also turn on Geo-tagging from this screen by altering the Show GPS info option. I maximize the video quality as well. This is achieved by turning on the Video Mode (Options/Video mode) and entering the settings as described above. In the Web Browser, I define a default access point by tapping Options in the lower-left corner, then Settings/General/Access point. That way I get rid of the confirmation screen that is displayed each time the browser is launched. From the Settings screen, I also enter the Page category and use the “Large” Font size option. The default setting is a bit too small for my taste, and the largest setting seems to mess up the page formatting on some sites. What I really would like, is that the browser automatically would adjust the rows of text to match the screen width, so no horizontal scrolling would be neccassary. Perhaps in a later firmware update? Finally I turn off security warnings from Options/Settings/General/Security warnings. 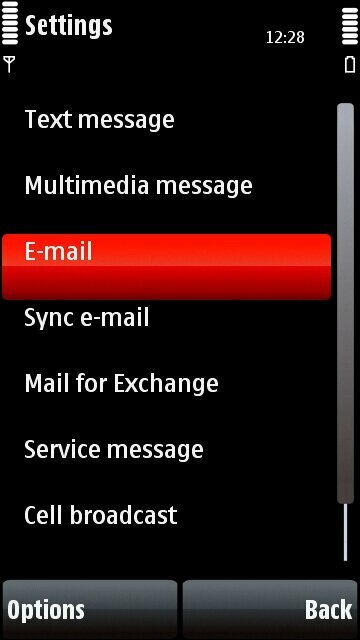 I turn on delivery notifications for text messages from Main Menu/Messaging/Options/Settings/Text message/Receive report, because unlike WinMo, Symbian actually handle them very well. On the same screen I turn on full support for character encoding, because I reckon – why not? I tap the Back button and enter the Multimedia message category, and turn on delivery notifications for them as well and change the image size to the Large setting at the top of the screen. I go back, and scroll down to the bottom of the list, and change a few things in the Other category. To be exact, I change the number of saved messages to 700 or so instead of the default 20, and also enable the Show messages in groups option, since I think it’s more practical with threaded messages. I tap Back a final time, and from the E-mail category I define my Hotmail and Gmail addresses. I generally use Profimail and Google’s java Gmail client, but it’s always nice with alternatives. I mainly use Alon MP3 Dictaphone to record audio, but I utilize the built-in application Voice recorder from time to time as well. I prefer my recorded audio as clear and crisp as possible, and hence select the High Recording quality option by launching the Voice recorder app, and then tapping Options/Settings. I change the alarm signal by tapping the clock on the home screen, then Options/Settings and finally Clock alarm tone. I use a song by now defunct Swedish indie outfit Yvonne called Bad Dream, because unfortunately it’s quite fitting for my current nightly subconscious adventures (or misadventures) and I’m a fan of self-irony. From Settings/Phone/Display/Welcome note, I select the Text option and enter something that will put a smile on my face. It is showed each time the phone is started, instead of the standard Nokia animation. While I’m there, I change the Light time-out to 30 seconds, 15 seconds less than the default 45, in order to keep the 5800 or N97 running a little longer on each charge. I also turn down the screen brightness a bit with the Light sensor setting for the same reason. For improved security in case the device gets lost or stolen, I change the lock code (default is 12345) from Settings/Phone/Phone mgmt./Security/Phone and SIM card and activate both the Lock if SIM card changed and Remote phone locking options. The last setting allows me to lock the device by sending a text message to it. For third-party security applications, these are both excellent choices. I saved the best for last: finally I install all of my favorite software. You can read my Top Symbian 5th Edition Software article for a guide to the Symbian application jungle, or just visit the newly launched OVI Store located at store.ovi.com on your phone’s browser and start downloading. There are naturally tons of more settings to play around with, but these are the most essential ones in my book. Good luck, and please leave a comment if you have any feedback! I like the blog, but could not discover how to subscribe to obtain the updates by email. That is really well laid out! Thanks. great tips and have followed them all. thanks heaps!